Well I have been saying for months that I wanted to start a blog and today was a good day to start. This is my first blog post and its kind of long - sorry!! I just felt that in order for you to understand where I am coming from in my future posts you need to know these things about us. My name is Jennifer and I am a Mom to 5 boys. My older 3 are my Stepsons that I have always treated like my own. I came into their lives at an early age. (I could probably write another blog about step parenting!) My Hubby and I have 2 kids together. My youngest son, Sam has Autism and Apraxia. Sam is 5 ½ now and he is nonverbal and is a very picky eater. He understands many things you tell him but he has a hard time communicating his needs at times. He also has no sense of Danger. He was diagnosed at 18 months but I knew he had it much earlier – around 6 months. I kept telling the Doctors I thought something was “off’ and kept getting told he is just delayed because he has 4 older brothers to do stuff for him. Finally after he turned a year old I set up an appointment with a pediatric Neurologist – the wait list was 3 months!! Got to Love that! Anyway I will never forget that day… “I am sorry but your son has Autism” said the doctor……I replied “Yeah Don’t be sorry but thanks for the diagnoses finally so I can start getting him what he needs – Therapy! !” After that day my husband, Rob and I never looked back. Sam was immediately enrolled in our states Early Intervention Program. He received OT, ABA, Speech and also developmental play time with other therapists. He also started feeding therapy at this age too. He stayed in EI until the age of 3. Our town tried to keep him in the town program but we had started researching schools before he was 2 and we knew the town program wasn’t right for him. He started going to a school for kids ages 3-21 with Autism. We love the school he is in but more importantly so does he!! He has just moved out of their preschool program and into their Kindergarten program. As Sam got older his behaviors changed. I had heard about a place that helps kids with Autism with Service Dogs. My sons ABA therapist, Angela, had told me about it. 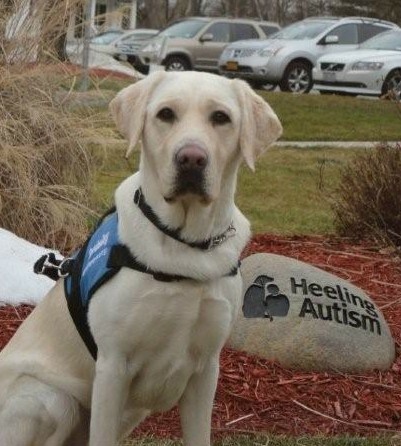 I immediately looked up the info and was on the phone with Caroline from Guiding Eyes for the Blind – Heeling Autism Program. She sent me out the application to fill out. At the time we filled it out our only need was to keep Sam safe in public. Sam did two things while we were out at this age (he was about 2). He sometimes refused to walk, throwing himself on the ground forcing us to carry him. I remember some days just crying as I had to carry him to pick up my other boys from school. I would have to park my car a few blocks from the school and I would try to get Sam to walk. He would then throw himself down and I would carry him. He would be so heavy and my arms would start to burn. We wound up getting a Pushchair for him; it was a special needs stroller. It looked like a wheelchair but had stroller wheels. He was too tall and heavy for a regular stroller. We hated using it though because when Sam went in it he would totally shut himself off and just zone out. He wouldn’t interact with anyone or anything. So we only used that when we had to for his safety or for times we just knew he wouldn’t walk…The other side to him was that he hated holding our hands and would often try to run off the times he would walk. This was always very scary for us. He refused to wear ID so if he ever did get away he wouldn’t even be able to tell anyone who he is or that he has Autism. We applied for the Service Dog and Caroline called us to set up the home interview. I will NEVER forget that day. Caroline and Maureen came down to our house with a Heeling Autism Dog named Randy. We owned dogs at the time and Sam never cared for them so I was very nervous how this was going to go. I envisioned Sam totally freaking out on this poor dog and them being like “Yeah Right – you are not getting a dog from us!” They brought Randy into the house and he was lying around and Sam sat on the couch doing what he still does – watching Cars. Caroline then said let’s try going for a walk with Sam and Randy. I laughed and looked at my husband and said “Well this should be interesting. There is NO WAY Sam is going to walk with this dog”. Boy was I wrong!! Rob and I walked behind Sam, Randy, Caroline and Maureen. I couldn’t believe what I was seeing. Sam WAS walking and holding onto Randy’s handle. There was even one spot where a branch was on the ground and Randy moved around the branch and Sam ran to keep up with Randy. I was so happy I cried. We begged Caroline to keep Randy right there and then lol we even offered her money ;-) but she had told us Randy was already spoken for and he was already going to help a family that needed him. They had told us the wait would be 2 years for a dog. Let me tell you that was a long 2 years but totally worth the wait! I had gotten the call in January of this year that they were training Hagrid for Sam!! I couldn’t believe it. I was crying again – for the record I usually never cry! The next step was going up to their Yorktown Heights facility for a week in April for Team Training. We were finally getting our dog. They emailed me a picture of him and I loved him so much before I ever even met him. The picture Caroline emailed me of Hagrid. It was love at first site! By this time Sam’s behaviors out in public had changed drastically and I had become a prisoner in our home. It was very very rough to take Sam anywhere and often I would just stay home with him. His meltdowns out were becoming very severe and I had no control. It was terrible to go somewhere knowing this would happen. I hated seeing him get so upset and not be able to help him…This was very hard on my family as we were always the get up and go type before Sam’s behaviors became so severe. My week in April arrived and for the first time ever I was leaving my family. I was so nervous but knew this was such an important thing I was about to do. I got to Guiding Eyes and was greeted my Maureen – she made me feel at home and we both chuckled that I came walking in with my Keurig Machine…Hey I can’t live without my coffee and I wasn’t sure what they would have at their facility. I unpacked my stuff in my room. They have separate rooms for everyone with a private bath, small fridge & cable TV. It was much nicer than I expected. I met up with the other Autism parents (there were 6 of us total) and we started our training. We trained for the week with our dogs, learning the commands and going out into the public. We went to parks, malls and stores to train. Our spouses or someone we wanted to come also came for a day of training. I forgot to mention the best part – They had a chef!! Yep for that entire week I didn’t have to cook a thing!! That was nice! Not only were we there but they also have an entire program for visually impaired men and women. That program is different than the Heeling Autism program. They stay for an entire month to train. Really it was an amazing week. On that Friday we had our final meeting and we were on our way home with our new dogs. They told us not to rush the bond; it could take weeks or months. I was so nervous on the way home wondering how would Sam like Hagrid and how would I keep Hagrid from bonding with my other boys instead. Well Sam and Hagrid bonded almost instantly. Sam who never once would touch our other dogs in the past was sitting next to Hagrid petting him just 1 day after bringing him home. It’s like they knew they were meant for each other. Hagrid has bonded with all of us in different ways. Sam and Hagrid bonding already after only a day of being together. Hagrid has been a true MIRACLE for us!! Sam and Hagrid are a perfect fit and now public outings are awesome and mostly stress free! Sam is like a different kid now. Since Hagrid is a Service Dog he can go anywhere with us. He is allowed out in public and into stores. Hagrid wears a vest that has a handle on it. Sam holds onto the handle but he is also tethered to Hagrid. Sam wears a belt around his waist and it is connected to Hagrid vest. If Sam lets go of Hagrid and tried to run off Hagrid will “Plant” himself on the ground so Sam can’t go anywhere. I then tell Sam he has to come hold onto his dog. Most of the time he will carry on holding Hagrid but sometimes he still wants to get away, like if he sees a toy he wants. Its then up to me if I want to bring Hagrid and Sam over to the toy or do I take Sam by the hand and make him hold onto the handle as we walk away. Once we are away from the toy he is fine. Sam now has very few meltdowns. He used to have them ALL of the time both in and out of the home. Hagrid calms Sam. Hagrid has had a positive impact on this entire family. He has given me back my life! One of the first times we were out at a restaurant with Hagrid, we were all enjoying our meal (which we weren’t used too) my 7 year old Josh said “It’s amazing how one life can change 7” and he is right! One of our many special walks together. Now don't get me wrong - Sam still has Autism and doesn't act like a typical child and we don't expect him to. When we go out we don't look typical at all - we do have a 70 pound yellow lab that is connected to my son. That would be the first tip off that something is up with us. I get a lot of questions and stares and that's fine with us. Sam is happier now. We are happier now. Outings are almost stress free. When he does have his moments it is nothing like it used to be. To remove the fear alone of Sam wandering off is great enough but we have been blessed with so much more. We knew Hagrid was going to be a great thing for us but we didn't realize just how great it was going to be. As I mentioned earlier Sam started Feeding Therapy at 18 months old. For years he lived on Cheez Its, Lays Potato Chips and Milk. Since we have gotten Hagrid, Sam has increased what he eats by so many things! I am not sure what the connection is between Hagrid and Sam eating – but hey I don’t really care – lol – whatever it is – its working! Sam’s feeding therapist had asked us to pick a target food for Sam to eat back when we started at 18 months. It was Chicken Nuggets. We picked those because we figured we could get them anywhere we go. So every session I would pick up nuggets and he wouldn’t even touch them. We tried for years to get him to eat them and nothing. Last year he ate them for 2 days then wouldn’t go near them!! After a few weeks of having Hagrid home Sam was actually requesting Chicken Nuggets with his PECS board. (PECS is how Sam communicates what he wants since he can’t talk. It’s great for certain things – like food that we know he likes. We have pictures of all of the foods he eats and what we wanted him to eat – so he will point to “I want – Chicken Nuggets”) Now the catch is he will only eat them in the car and from McDonald's or a place like that but it’s a GREAT START!! When he is in the mood he will eat 15 of them. Anyway that is part of my story – the quick version – lol – the rest you will all have to wait for my book! Hey!! Did you see us on the News?? I'm sorry but my Dog ate my homework! !